When I was little I always wanted to grow up to become a vet. I was so sure that I wanted to become a vet that I never let any other job options come into my head. Then I started thinking that becoming an engineer would be cool. Then I found Pretty Brainy, which is an organization that takes young ladies and teaches them about electricity and how to install lights into houses. Then we work with Environmental Lights to design and install LED lights into certain rooms in a Habitat for Humanity house. Pretty Brainy has been one of the most memorable experiences of my life. Over the weeks I participated in this program I learned about electricity and soldering and built a 3D model of the Habitat for Humanity house kitchen. 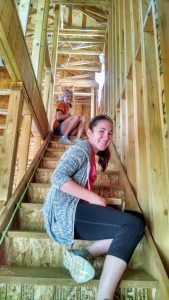 Madeleine and her teammate Autumn wire the stairway of a Habitat for Humanity home in preparation to install LED puck lighting. My favorite day of Pretty Brainy was when we learned how to solder. Before Pretty Brainy I had never even heard of soldering. When I received my soldering kit and opened it, I was amazed that in the next two, short hours I would know how to operate a soldering iron. First we started practicing by soldering two pieces of wire together. Then we soldered together a Simon Says game and it actually lit up and made sound. I felt like I had acquired a great skill that would be useful to me. It probably will become a very useful skill if I pursue my dreams and become an aerospace engineer. Environmental Lights has been a cool company to work with because they not only supply us with the lights, but they also help teach us about their products and how to work with them. One of the times we talked with Environmental Lights they told us about the different shades of white that are available to use and how to use a dimmer to control how bright or how soft each light is. The second time they taught us about voltage drop and how to fix voltage drop. It was very confusing at first, but with all the notes I took I figured it out eventually. There were a lot of different groups in Pretty Brainy. Each group had a few college engineering students and a few middle school- to high school-age girls. Each group was assigned a different room to light (living room, exterior, closets, bedroom, etc.). My group was assigned the undercabinet lighting in the kitchen. After we figured out which lights we were going to use, we built a 3D model of the kitchen and put orange straws where the lights would be. It took a while, but in the end it turned out to become a really cool model. We built a fridge and cabinets with cereal boxes in them along with little jars of flour and sugar. In the end our model became a huge part of our final presentation to our client, Habitat for Humanity. At the end of [the design phase of] Pretty Brainy we all gave presentations about our design, the lights in our design, and why we chose them. Our group talked about how undercabinet lights with a dimmer would be very useful in a kitchen, because, for example, if you are using sharp knives under a cabinet that blocks the light so it’s harder to see the knife you are cutting with, it could be dangerous. That makes it a safety hazard. This past week I went to the actual Habitat house with Pretty Brainy and put wire in the wall for the puck lights on the stairs. 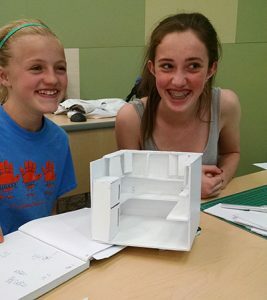 Madeleine and her teammate Kyra work on their scale model for the Habitat for Humanity kitchen and undercabinet lighting. Overall, Pretty Brainy has been amazing. I could not think of a better way to spend my Friday nights. I am sad that it’s nearly over and I wish it could continue forever and ever. I hope other girls my age get this amazing opportunity to participate in this awesome program. I have learned so much and helped my community while doing it. I want to thank everyone who is helping me want to become an engineer. My name is Madeleine. I go to Bill Reed Middle School and am in the 8th grade. My hobbies include running on my school’s Cross Country and Track Teams (especially distance), reading mysteries, and writing. I enjoy school very much and am so excited for high school next year.